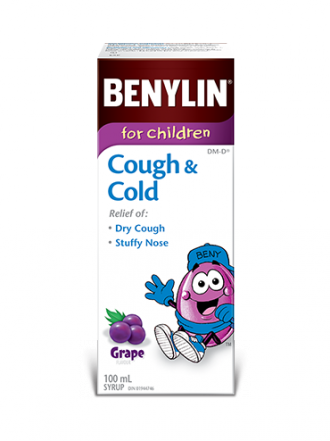 BENYLIN® For Children Cough & Cold Syrup is an effective solution that relieves your child’s toughest cold symptoms. Shake well before using. Use only the enclosed dosage cup designed for use with this product. Do not use any other dosing device. Give 10 mL every 6 hours, as needed. Do not give more than 4 doses per day. Read the complete label and leaflet before use and follow all the label instructions. DO NOT USE THIS PRODUCT IN CHILDREN UNDER 6 YEARS OF AGE. DO NOT use with a monoamine oxidase inhibitor (MAOI, drug for depression) or for 2 weeks after stopping the MAOI drug. If symptoms worsen, last for more than a week, or are accompanied by a high fever (>38°C) or the production of thick yellow/green phlegm, talk to a healthcare practitioner. Do not use if the child is allergic to any of the ingredients. Discontinue use if allergic reactions such as wheezing, rash or itching develop. Side effects may include: allergic reaction, breathing difficulties, convulsions, drowsiness, hallucinations, and rapid heart rate. CHILD RESISTANT PACKAGE. Store between 15°C and 25°C. Security Feature: Do not use if seal over bottle opening is broken or missing. In Case of Overdose: contact a doctor or Poison Control Centre immediately, even if you do not notice any possible signs or symptoms such as increased sweating, nausea, vomiting, stomach pain and loss of appetite. Citric acid, FD&C Blue No. 1, FD&C Red No. 2, flavour, glycerin, monoammonium glycyrrhizinate, sodium benzoate, sodium carboxymethylcellulose, sodium citrate, sodium cyclamate, sorbitol, water. My son cannot take any antihistamines and this product is antihistamine free with effective treatment for his mild to severe colds. This product also passed the taste test for my very picky son. It masks his cold symptoms just enough to help him get through the day and/or night. I would highly recommend if you do not like to give your child overly strong medications. A great product for your children.